All kinds of fun facts about Holmes surfaced Sept. 9 at Country Manor in Sartell when author Jeff Falkingham entertained visitors to Drakes Fine Food and Spirits bar and restaurant, which from now on will be open to the public, as well as Country Manor residents. Drakes opened in May, part of the Waterford Apartments addition to Country Manor, a complex of 40 high-quality apartments for senior living. Recently, said Drakes manager Kim Foshaug, it was decided to invite the public in during its open hours, 11 a.m.-9 p.m. seven days a week. Other menu choices include Baked Pasta Alfredo, Shrimp Pasta, Drakes Chicken Boursin, salmon, deluxe hamburgers and lots of salad, including spinach with mango vinaigrette. The head chef is Kasey Davis of Sartell, formerly of Champlin. Davis, Foshaug and others – mostly Country Manor residents – gathered to hear Falkingham share facts and insights about Sherlock Holmes, perhaps the most famous fictional character in all of literature. And it’s no wonder the fame, with books about Holmes having been translated into 60 languages and having sold at least 100 million copies during the past 125 years since Holmes was “born” under the pen of Sir Arthur Conan Doyle. During his presentation, Falkingham dressed as Dr. Watson, who is the narrator of the Holmes novels and stories. At his side, Sherlock Holmes was portrayed by Al Pfeifle of Sartell. There were two presentations Sept. 9, and a woman, Judy Boe from Wisconsin, portrayed Holmes for the second show. Doyle, born in Edinburgh, Scotland, became an eye doctor who practiced in London. Also an author, he wrote historical fiction and science fiction, but it was his creation of sly, brilliant London detective Sherlock Holmes that brought him immediate and lasting fame. Doyle wrote four Holmes novels, including A Study in Scarlet and The Hound of the Baskervilles, as well as 56 short stories featuring Holmes and his sidekick and roommate Dr. John Watson, a surgeon. At one point, Doyle wearied of writing his Holmes stories and finally “killed him off” in a story, the victim of his arch-enemy, Professor James Moriarty. Shocked readers, however, raised an uproar about the death (thrown from the top of a waterfall). Doyle, pressured relentlessly by his reading public, felt compelled to “resurrect” Holmes, explaining in the next story that Holmes had faked his death just to trick Moriarty and get him off his trail. The first visual image of Holmes was created in 1891 when an edition of Holmes was illustrated by British artist Sidney Paget. He evoked an image of Holmes as a tall thin man who wore a deerstalker’s hat and a shoulder cape. That image stuck with the public, and Paget drew hundreds more of them as the novels and stories appeared, serialized, in The Strand magazine in Britain. So many actors have portrayed Holmes on stage, in movies and on TV that they are virtually impossible to count. Among the most famous stage actors were William Gillette, a hugely popular British actor, who performed in theaters far and wide as Holmes from 1899-1930. It was Gillette who introduced the famous drooping smoking pipe to Holmes. From the very beginning of movies in the silent-movie era, Holmes was a hit with audiences in 20-minute black-and-white movies. The first film was produced in 1914 starring James Braggington, an English actor. Another Brit, Clive Brook, starred as Holmes in the first “talkie” movie, and Brook – also a writer and director – is credited with introducing the “Elementary, dear Watson” line for Holmes. Probably the most famous actor to portray Holmes in movies and TV was Basil Rathbone in a prolific five-year period from 1939-1946. Other actors who have taken on the role of Holmes on stage and/or screen include Peter Cushing, Leonard Nimoy, George C. Scott, Charlton Heston, Frank Langella, Jeremy Brett, Robert Downey Jr. and literally hundreds more, professional and amateur – most recently Benedict Cumberbatch in “Sherlock” a TV series by the British Broadcasting Corp. The reason for Falkingham’s wealth of knowledge and trivia about Holmes and Watson is because he has written two historical novels, based in Minnesota, in which a guest detective from London, Sherlock Holmes, travels to Minnesota to solve some serious crimes, including murders committed by a serial killer. Falkingham’s first novel takes place in his home town of Browns Valley, the second in St. Paul. Unlike the Doyle novels and stories, however, Falkingham chose a strikingly different narrator from the very proper and stiff-upper-lip Dr. Watson. Falkingham chose a 12-year-old boy as his first narrator, one whose speech is very colorful with touches of street slang. In the second novel, that same boy narrator has become a 22-year-old man. Someone described Falkingham’s Holmes novels as “Minnesota history disguised as murder mysteries.” It’s a description Falkingham likes. Both books combine factual history with mystery. His goal, he said, is to inspire young people to take an interest in history, especially local history. Falkingham’s first novel is entitled Sherlock Holmes and the County Courthouse Caper. His second is Sherlock Holmes: In Search of the Source. Both have four-and-one-half star ratings on amazon.com, where both books can be purchased. 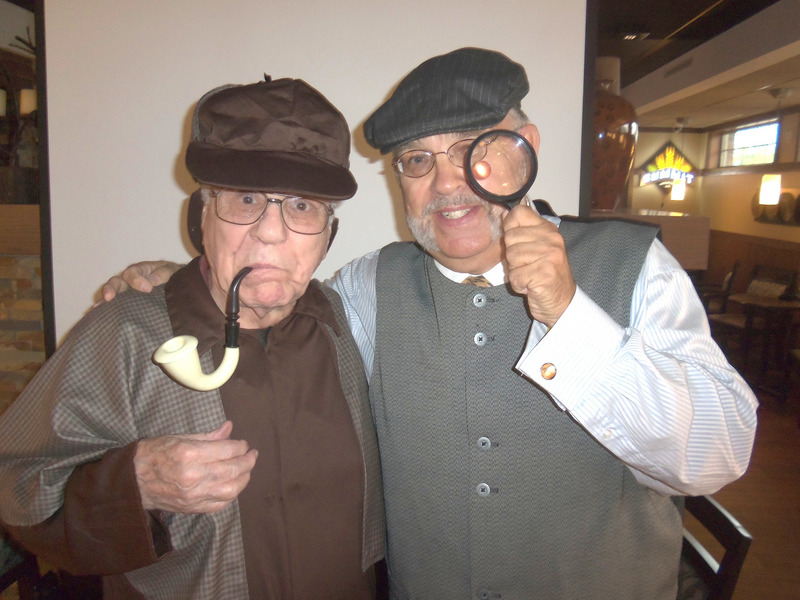 Joe Pfeifle of Sartell (left) as Sherlock Holmes and Jeff Falkingham as Dr. Watson spoof a bit during their presentation at Drakes Fine Food and Spirits restaurant and bar in Sartell. The place is now open to the public, as well as residents of Country Manor in which it is located.